Tom Doyle is a partner in Pierce Atwood's Environmental & Land Use Practice Group with 30 years of experience in all areas of environmental and land use law, including adjudicatory proceedings, transactions, permitting, client counseling, enforcement defense, brownfield redevelopment, and legislation. Tom's practice has frequently involved the successful permitting of major development projects that face opposition or complex environmental and land use issues. His transactional experience has included serving as lead environmental counsel in public offerings, mergers, acquisitions, divestitures, site divisions, and project financings. He also has long advised the forest products industry on a variety of strategic environmental, natural resource, land use, and policy issues. Lead environmental counsel on a $1.4 billion project to improve the reliability of Maine's electric power system. This is the largest transmission project ever built in Maine. Successful licensing of two new tissue machines for a major pulp and paper company in northeastern Maine. Lead counsel for the operator in the successful federal, state, and local licensing of a 9.35 million cubic yard horizontal expansion of the State's Juniper Ridge Landfill. Representation of a major pulp and paper manufacturer in the successful licensing of a new tissue machine project in western Maine. Successful licensing of two of New England's first compressed natural gas production facilities. Lead counsel in the effort to modernize and streamline Maine's metallic mineral mining laws. Successful licensing of two vast greenhouses (totaling 42 acres) to grow tomatoes, the largest facilities of their kind in the Northeast. Lead environmental counsel for the largest island community wind project in New England. Successful licensing of an additional 7 million cubic yards of waste disposal capacity for the operator of a state-owned solid waste landfill. Approval obtained after a contested state proceeding. The only private attorney over the past 25 years to have successfully led the licensing of a new solid waste landfill in Maine, a feat Tom has accomplished twice. Spearheading the successful licensing of a state-of-the-art semiconductor fabrication facility, which obtained its applicable state licenses in 21 days, the minimum time required by state law. Lead environmental counsel on a $1.4 billion project to improve the reliability of Maine's electric power system. Recently completed, this is the largest transmission project ever built in Maine. Lead counsel on the successful development and construction of two of New England’s first compressed natural gas production facilities. Lead environmental counsel for the permitting and construction of the largest island community wind project in New England. Provides long-term and ongoing environmental counsel to an international oil pipeline that traverses three states and the U.S. border with Canada. At Yale, Tom quarterbacked the Yale Football Team, earning All-East and All-Ivy honors, and was drafted by the NFL's Oakland Raiders. 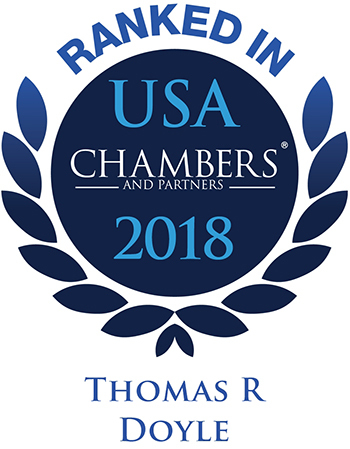 Chambers reports that Tom Doyle calls upon over 30 years of experience to advise clients in a wide variety of environmental law and land use issues. His diverse practice includes strengths in permitting and licensing matters, corporate transactional work, development projects, and adjudicatory proceedings.